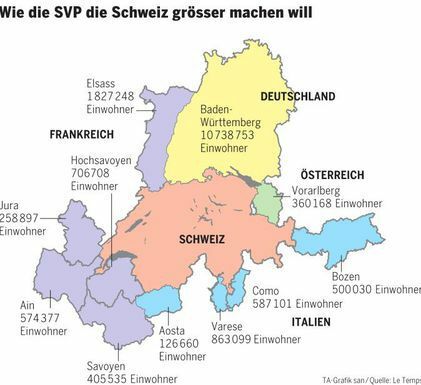 swiss conservatives: annex regions surrounding switzerland! yesterday’s tagesanzeiger report on a parliamentary motion of the swiss conservatives right-wing, nationalist party SVP to prepare the annexation of all regions surrounding switzerland — no, today’s not the first of april. as the tagesanzeiger rightly observes that would add about 10 million germans to the population (plus almost another million german speaking citizens of alsace, vorarlberg, & bolzano) — just a couple of months ago the SVP, never afraid of playing the lowest available instruments of fear, uncertainty, and doubt, staged a campaign claiming that the ETH was being overtaken by german professors (skillfully representing sliced statistics to “prove” their point). …except, perhaps there’s more behind this, as der schweizer narr writes: right-wing politicians in switzerland and elsewhere in europe are voicing their opininon that the EU is doomed to fail and that we are currently seeing the beginning of the end of the EU — the SVP motion could be interpreted to play the separatist tune and try and solicit resonance from similarly minded circles in those surrounding regions. is there method to the madness? after a long day on the train — starting with the 8:43 ICE International train from cologne to brussels, then the Eurostar to london st pancras, followed by the virgin pendolino from london euston (yep, a short walk from there) to oxenholme lake district, and, the last train for today, the First Penine 185 class service to windermere — we have finally arrived at the riverside hotel in ambleside. dinner was at zeffirellis, a restaurant recommended by our friends p & w (as well as our host david) — a vegetarian italian restaurant with an interesting menu. the food is good, as are the drinks (red wine for mrs d, a theakston for me) and the waiters are really friendly. cut or shred the salmon into little pieces. wash the rucola leaves in a colander and shake off the excessive water. mix the rucola, and the salmon pieces in a bowl. add the oil and the mustard along with a couple of squirts of the lemon juice. mix well. season well with salt. add croûtons if you like.